MEDICATIONS OFTEN HAVE frustrating side effects such as nausea or headaches. But did you know that dry mouth is also a common side effect of prescription drugs? There are over 400 medications that can affect your salivary glands. These medications include those used to treat depression, anxiety, pain, allergies, diarrhea, urinary incontinence, Parkinson’s disease, and many other conditions. Our salivary glands are extremely important because they produce saliva. Saliva keeps our mouths moist and breaks down the foods we eat. It also helps keep the bacteria in our mouths under control. If you or someone you know is taking medications that may be causing dry mouth, there are plenty of things you can do to help keep your mouth moist and healthy. Drink more water! Sip on it throughout the day. Mineral, Carbonated water and Club Soda work really well to stimulate your saliva, too. Chewing sugar-free gum helps keep your mouth moist and salivary glands active. Just make sure the gum is sugarless. Sucking on Sugarless Mints is also very effective. Try eating frozen fruits. Frozen fruits may be soothing and satisfying to your dry and uncomfortable mouth. Consider limiting your caffeine and alcoholic intake. It’s easier for your body to become dehydrated when consuming alcohol or caffeine. Possibly use a humidifier while sleeping. This can help keep your skin and mouth hydrated. Keep up with your daily oral care habits. Brushing and flossing help save your teeth from decay and other damaging problems caused by dry mouth. Keep your regularly scheduled appointments. 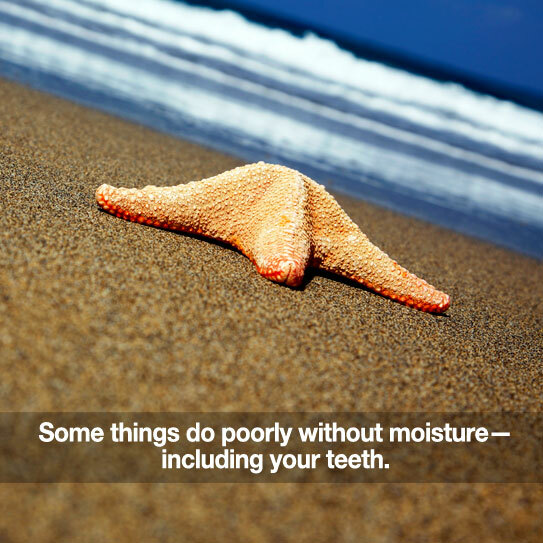 We’ll help you prevent serious problems that can result from dry mouth. Use Saliva replacement products, such as the Biotene group of products, are also effective. If you are having a lot of trouble with dry mouth, contact us. You may also want to consult your general physician about trying different medications or adjusting your dosages. Thanks for reading our post! Please share it with others who could benefit! Our goal is to help your smile stay beautiful and healthy.